The objective of the RTT was to perform activities that can ultimately improve usability (and re-usability) of IMOS radiometric data sets for research purposes as well as for validation of satellite ocean colour products. Improving usability essentially means improving the quality of the data sets, and improving re-usability means that data collection, processing protocols and associated uncertainties are well described. Another objective was to develop a plan for the evolution of radiometric measurements in IMOS for the next decade as there have been other developments in optical instrumentation that Australia will need to adopt. 1. 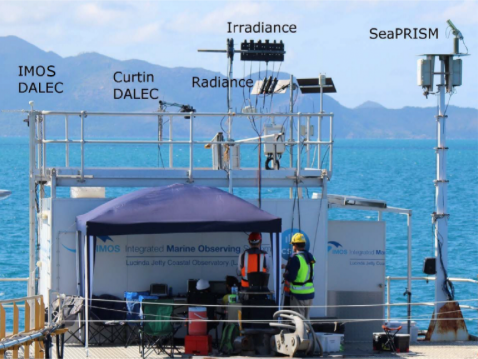 Evaluate the degree of consistency among existing field-platform and sea-going radiometers used in the IMOS and the wider Australian bio-optical community, through dedicated laboratory and field experiments. 2. If needed, propose actions to improve consistency among these instruments; the way they are deployed (protocols) and the way data are processed. 3. Develop a plan for the evolution of IMOS radiometric measurements for the next decade. - The final report of what we did (to come).